Staff members at IAM Headquarters donated and wrapped presents for two needy families in the Washington, DC area. As the holidays draw closer, IAM Headquarters and Local Lodge 1943 in Middletown, OH, have been busy making the season just a little bit brighter for families in their communities. Staff at Headquarters spent the last two weeks collecting gifts, clothes, goodie-filled stockings, and grocery and gas gift cards for two needy families in the Washington, DC area. The staff raised $1,235 plus gifts for the families. Santa (Local Lodge 1943 member Todd Rowe) and 3-year-old Michael Creekbaum at the Local Lodge 1943 Annual Children’s Christmas Show in Middletown, OH. The gifts were wrapped and delivered to the families by the staff themselves. 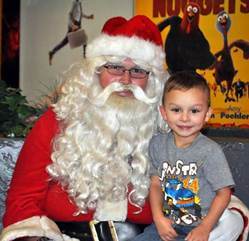 Local 1943 hosted its annual Children’s Christmas Show recently, renting out a local theater for members and their families. Local 1943 members are employed at AK Steel and Pilot Chemical in Middletown. Nearly 700 people showed up for a full day of movie access featuring seasonal choices as well as current box office hits. Festivities included an array of prizes geared toward children and one special grand prize for adults who brought their children with them. But for many of the children, Santa was the star of the show.